`[Meikle's] aim is to make proper sense of Aristotle's economic thinking, and in a detailed, lucid discussion he succeeds brilliantly.' Peter Jones, Sunday TelegraphAristotle's work on money was the backbone of medieval thinking about commerce, and it is still the foundation of Catholic teaching about market behaviour. Marx's theory of economic value was based on it, and so was much of the economic analysis of money into the present century. In the past hundred years the interpretation of Aristotle's work on money has become chaotic. Economists claim Aristotle as the father of economics, while classical scholars hold that Aristotle had no economictheory at all. 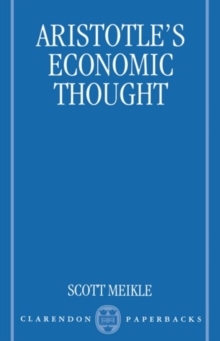 It is argued here that Aristotle does develop a coherent theory of economic value, wealth, exchange, and money, but that this theory cannot be assimilated to what we call economics because its metaphysical foundation is incompatible with the Humean metaphysics on which economics is built. From an Aristotelian standpoint, ethics and economics are competitors over the same ground, as rival sources of reasons for decision-making in the public realm, and they cannot be reconciled.